Hill Country Conservancy invites you to join us for our monthly Birding + Nature Hikes at Nalle Bunny Run Wildlife Preserve, every 3rd Saturday of the month. These hikes are $5.00 per attendee and open to the public. A very special thank you to Mikael Behrens, Emerging Professionals in Conservation (EPIC) Member and Nalle Bunny Run Wildlife Docent for leading hikes at Nalle Bunny Run Wildlife Preserve. Directions and further information will be sent the week of the hike. The 35-acre Nalle Bunny Run Wildlife Preserve is not only an environmental treasure, but an important habitat restoration project situated on the banks of the Colorado River. The preserve was donated to Hill Country Conservancy in December 2000 by the Nalle Family who wished for years to preserve the beloved “Bunny Run” for the public to enjoy. 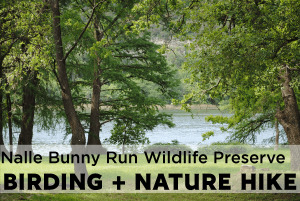 The conservation management of this preserved Lake Austin waterfront and proximity to Austin make the Nalle Bunny Run Wildlife Preserve a visual and environmental masterpiece. Wildlife is vitally important to the health of an ecosystem and is central to the Preserve’s mission to enhance habitat. The Nalle Bunny Run Wildlife Preserve is managed primarily for the benefit of songbirds, small mammals, and for migratory, wintering and breeding waterfowl. To ensure proper wildlife management of this vital piece of habitat, the Preserve is only open to the public through guided hikes such as these monthly birding and nature hikes. All hikes are weather permitting. There are no restroom facilities on the preserve. Please leave any pets in the comfort of your home. Please note that unregistered parties will NOT be able to join the hike. You MUST register through this site to attend. For more information about the hikes or Hill Country Conservancy, please contact sarah@hillcountryconservancy.org.